The Yamaha 6200 Symphonic Series The Symphonic series timpani are ideal for high school and college band, orchestra, percussion ensemble, and marching band. With its sleek finish and pure resonance, the 6200 Symphonic series offers professional-grade sound quality for all levels of repertoire. The 6200 Symphonic series uses smooth copper bowls spun to precision to ensure uniform wall thickness for pure resonance and a beautiful tone. To further enhance dynamic range and tonal projection, the bowls are freely suspended in a steel support ring. This design allows pure, undistorted sound even at dynamic extremes. 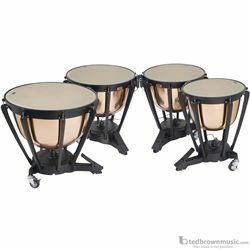 Remo Custom Renaissance heads are included with all 6200 Symphonic series timpani, along with an aluminum insert ring. In addition to its exceptional sound quality and value, the 6200 Symphonic series boasts many features that allow the performer to play in their most natural and comfortable position. The 6200 Symphonic series features the Yamaha- exclusive PAC (Pedal Adjustment Clutch) system. The PAC allows the artist to change the resistance of the pedal to accommodate each performer's individual playing style. The PAC is located on the base of the timpani and be easily adjusted with a timpani key. The recessed tension rods stay out of the performer's way, especially during sweeping motions. The cable-linked tuning gauge with letter and accidental indicators increase the performer's tuning accuracy and provides convenient tuning changes during performance. Heavy-duty four inch locking casters provide durable mobility and ensure the timpani will not roll during performance. A reinforced third-wheel attachment assures a secure hold during transport. The copper bowls, PAC, sleek design, and superior sound quality make the 6200 Symphonic series a superior choice for high school and college timpanists. Bowls Freely suspended copper bowls. Pedal Adjustment Clutch Streamlined PAC system. Heads Renaissance head with aluminum insert ring. Balanced Action Spring Mechanism Maintains proper balance between head and pedal tension.